I guess I never included a pic. Since I don't pick Misty up until next Friday I don't have pics of my own but this is what the owner sent me. Gorgeous dog but talk about needing a trim! I see spots!!! Cool dog. That dog looks like it can cover some ground! 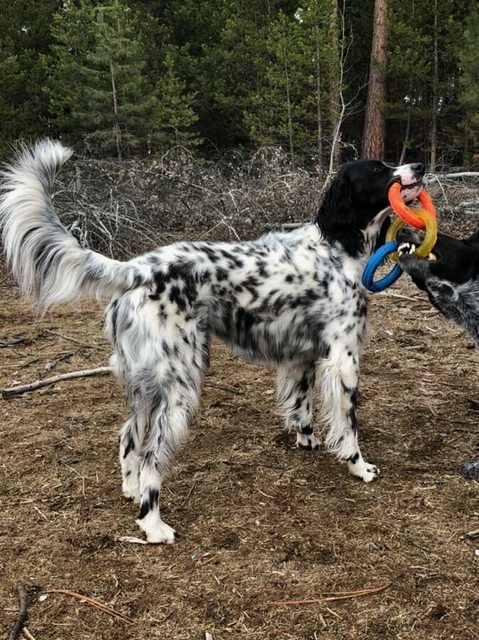 I’m a little surprised there aren’t more setter owners on this forum, at least of the multiple dog owners. Libertyrocks wrote: That dog looks like it can cover some ground! She comes from all-age field trial lines so I'd imagine she can cover some ground. T's Nickelback, Tekoa MTN, Equinox. Looks like you've got some fun times ahead. Best of luck with the new girl. Looking forward to seeing posts of the dog striking poses in the beautiful country you live in. The combination will make for some special photos. Nice to see you excited about this and the dog getting such a wonderful chance to make good. Nice. Good luck with her! Sorry it didn't work out, but probably the best for everyone. flitecontrol wrote: Sorry it didn't work out, but probably the best for everyone.